Queens Park Rangers play at home this weekend – and that must be a relief. On home form alone, Harry Redknapp’s team would be eighth in the Premier League, just behind Arsenal, after winning four and drawing two of their eight home league matches at Loftus Road this season. On home form alone they would be above Liverpool, Everton and Tottenham among others. 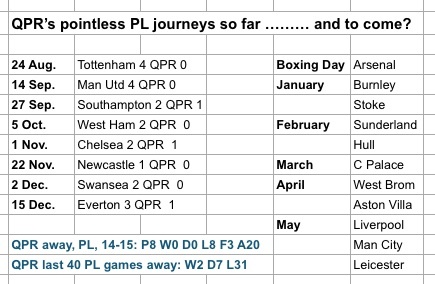 But Queens Park Rangers play away at Arsenal on Boxing Day – and that, on the form of the past few years, must be a huge concern. They have played eight times away this season and lost all eight. The last time they were in the Premier League, in 2012-13, they won just twice away. In fact their woeful away record, over the past 40 away games in the Premier League, has led to just 13 points from 120. The table below details the worst 10 ‘away seasons’ in Premier League history, including the records of the six sides who went through entire PL campaigns without a single win. Coventry in 1999-2000 and Leeds in 1992-93 both fell into that category but both managed seven away draws and had good enough home records that they stayed up. The other four teams who were winless on the road all went down: Wolves in 2003-04, Norwich in 1994-95, Hull in 2009-10 and Derby in 2007-08. As the table shows, a total of seven or fewer away points carries a strong chance of relegation, or a 70 per cent chance based on this sample. And six or fewer away points carries a virtually certain chance of going down. It didn’t get much better for the teams (not displayed) who won eight or nine away points. Nine teams have won as few as eight away points – and all were relegated. Five sides have won as few as nine away points – and three went down. The lesson for Harry Redknapp from all of this, bleeding obvious though it may be, is that he needs to change QPR’s extremely long-term Premier League travel sickness, and quickly, and significantly, or else QPR are going down. Merry Christmas, ‘Arry! Newcastle host Sunderland on Sunday in the north-east derby and this particular relationship throws up a Premier League statistical quirk. Typically over a long period of time, you’d reasonably expect any one team to gain more points at home against any one opponent than you’d expect them to win away against the same opponent. But Newcastle have won fewer points on their own turf against Sunderland, or 16 points from 12 meetings, at a rate of 1.33 per game, than they have away against Sunderland, or 20 points from 12 games, at a rate of 1.66. Being really good away in derbies would be one explanation – but it does not explain why Newcastle have been relatively so poor at home against the same team. Derby pressure and related tension, perhaps. 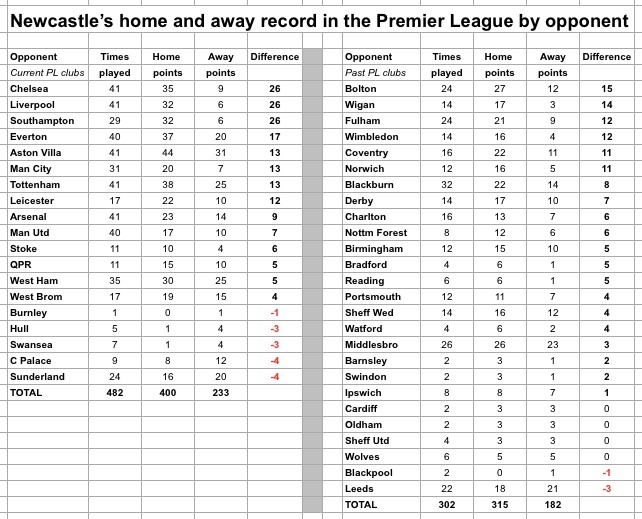 Here is Newcastle’s home and away record in the PL against all PL opponents, showing clearly the anomaly of their relationship with Sunderland.